The new Montana WHITE featuring 51 high covering colors is created for the budget continuous user that demands quality. The improved synthetic paint base boasts a hard wearing gloss finish that is weather proof for use in all seasons. 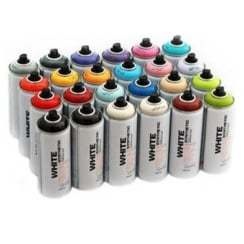 Montana WHITE utilizes a synthetic paint base to achieve a fast drying time, with a gloss finish. Made in Germany to the highest quality standards. ID required when purchasing paint.